I'd never felt sympathy for a fly until I just watched this latest, astounding clip from BBC Life in which a Venus Flytrap consumes murders its prey. The time lapse growth footage was captured over a period of two to three weeks, which is the time it takes for the leaves to grow into fearsome jaws. But maybe what's even more remarkable than the images is the sound. 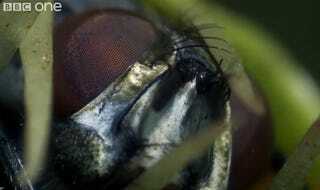 As the fly whimpers in futile struggle, you wish your ears could cry.